If distinguished service to humankind is in the DNA of every Eure, no greater example was set than that of the late Thad Eure, Sr., North Carolina Secretary of State from 1936-1989. A yellow dog Democrat, self-described as “the oldest rat in the Democratic Barn,” Eure was beloved among the citizens of North Carolina for more than half a century. The son of a farmer from Gates County, Eure’s roots in public service first budded when the young lawyer was elected mayor of Winton, North Carolina in 1923. Three years later, Eure was elected to the North Carolina House of Representatives and then to Secretary of State in 1936. During his campaign for Secretary of State, his slogan, “Give a young man a chance!” echoed across the state as he rallied for votes from Waynesville to Wilmington. In his unequaled tenure, Eure developed a unique style of dress and character beginning with a straw hat he wore every April 5th to celebrate the coming of spring as well as his father’s birthday. Each time he convened the state legislature during his 53-year tenure, he wore the same gray-and-black striped trousers that he wore for the first time in 1931. He also used green pens – once fountain and later felt-tip – with which he signed more than two million documents issued by the state in his unmistakable penmanship. And then there were his trademark bow ties which became a beloved legend in state government. In his early days, he donned polka-dotted bow ties. In the 1970s, he chose paisley designs. In the 1980s, as he reached his milestone tenure, the red bow tie that he tied every day made Eure the most colorful, dapper elder statesman to hold office in the history of the United States. His warm-hearted, witty nature and colorful character made him a welcome ambassador throughout the state as he traveled and participated in events that matched his reputation. Eure drew crowds at the annual Waynesville Ramp Festival and at the Spivey’s Corner Hollerin’ Contest. He was also a crowd-pleaser as the Rocky Mount Chitterling Festival and the annual meeting of the Possum Breeders Association of America. A friend for more than 50 years, the late Jim Graham, former North Carolina Secretary of Agriculture, said of Thad Eure, Sr., “He was, without question, the foremost politician and statesman of our time and beloved because he was synonymous with good government. They broke the mold when they made him and he will never be duplicated.” E ure’s 1936 campaign slogan, “Give a young man a chance,” took on special significance in 1959 when his son, Thad Eure, Jr. struggled to find financing for a restaurant that would be built in the middle of nowhere. Initially, the elder Eure scrutinized his son’s choice of locations, but instinctively he knew that showing faith in his son was the right thing to do. And a Eure could always be counted on to do the right thing! Eure mortgaged his farmhouse to help build his son’s dream. Giving his son that chance gave us the now iconic Angus Barn. Eure influenced generations of politicians, including every governor from Joe Broughton to Bev Perdue. He was also a mentor to many United States senators, and he knew and worked with every president from Roosevelt to Reagan. In 1987, President Reagan recognized Eure as having held public office longer than any official in the nation with more than 64 years of continuous service. At his 88th birthday party, when he announced his retirement, he declared, “I once again say, give a young man a chance!” indicating his outstretched hand to his younger successor. 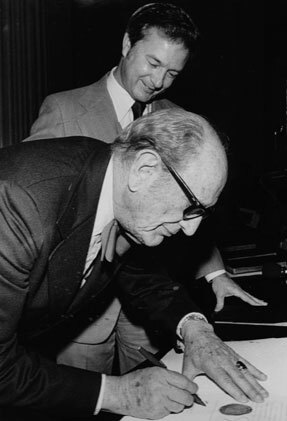 Eure finally retired as North Carolina’s Secretary of State in 1989. In an age of never-ending political scandals and partisan bickering, Eure, Sr. remains a one-of-a-kind politician, orator and statesman. His longevity and love of North Carolina and his country may never be equalled. For all that Thad Eure, Jr., accomplished in his brief 56 years of life, perhaps no greater tribute can be paid him than the continued success of “Big Red,” the nickname he lovingly gave the Angus Barn. As any person fortunate enough to know the late Thad will tell you, his life was not measured by the number of restaurants he founded but by the number of people’s lives he touched. He brought out the absolute best in everyone and regarded each person as his equal. A gentle giant of a man who stood 6’4” tall, his life and work led Restaurants & Institutions magazine to call Thad “larger than life.” His handshake was memorable not just because his hands were huge but because both his presence and his touch conveyed the towering generosity for which he is remembered. A starting tackle for the University of North Carolina, he was later recruited to play football professionally. Instead, patriotic duty prevailed when he was drafted into the Air Force where he served for four years. Just out of the Air Force, Eure and lifelong friend Charles Winston set their sights on opening a steakhouse. When they chose a rural setting between Raleigh and Durham, the business community laughed. Financing their steakhouse proved their first herculean task. Against all odds, on June 28, 1960, they opened. What Eure was able to envision at the young age of 27 was the sprawling growth that lay ahead for the area between Raleigh and Durham. His visionary ability would help him build a restaurant empire and contribute significantly to the betterment of North Carolina and the city of Raleigh. 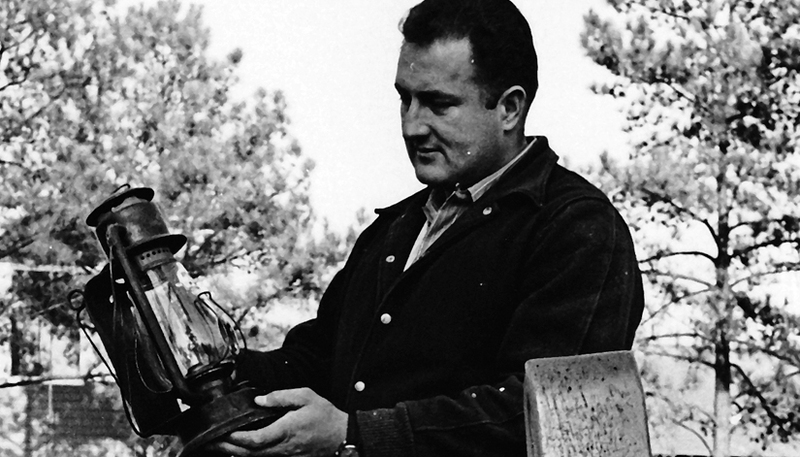 In February of 1964, Eure demonstrated the rare ability to treat tragedy and success equally when the Barn was destroyed by fire. What others saw as the destruction of his dream, Eure viewed as an opportunity to build a better restaurant. Not only would he and Winston improve on the design and size of their original Barn, they would open within one year. Good Samaritans that they were, they ensured that jobs were found for every employee, many of whom worked on the construction team. With Eure’s optimism, the new, expanded Angus Barn opened within a record-setting 11 months. Critics now realized that to bet against Eure was to risk losses the size of Eure’s successes, and his successes were epic. As “Big Red” thrived, Thad’s insatiable appetite for collecting antiques and artifacts grew. Eure’s unrelenting imagination assembled all the elements for one of his most successful enterprises: Darryl’s. This concept centered around three primary elements: eclectic décor featuring vintage double-decker buses, cabooses and old jail cells; a varied menu featuring Adam’s ribs and meatball sandwiches; and of course, Eure’s trademark hospitality. The flagship Darryl’s opened on Hillsborough Street and proved to be an enormous hit. After Eure built twelve Darryl’s, General Mills purchased the concept, peaking at 39 restaurants. As Eure’s golden touch spread distances, his touchstone always remained “Big Red.” Eure developed a keen business acumen and a philosophy he branded “We’re Glad You’re Here!” based on treating guests and employees with utmost respect and appreciation. Eure, known throughout the restaurant industry as “Mr. Hospitality,” practiced precisely what he preached. The 1980s brought the age of tofu and alfalfa sprouts and with it, Eure’s rebuttal: Fat Daddy’s. The public loved the oversized menu items and monster burgers. Eure’s newest venture once again defied odds. Fat Daddy’s thrives today! Eure’s instincts served him well when he set his sights on reviving the very first restaurant he visited as a child. A beloved Raleigh landmark, 42nd Street Oyster Bar originally opened in 1931 as J.C. Watson’s Grocery Store which quickly evolved into an eatery. The store not only served oysters but after prohibition ended, it sold draft beer. Eure once recalled one of his many visits as a child: “I remember Dad telling Mom he was going to the restroom; he actually went upstairs to get a cold beer.” He also remembered oyster shells on the dirt floor and guests that included well-known North Carolina politicians. Clearly the history of the city of Raleigh was indelibly woven into this establishment’s history. When 42nd Street Tavern was condemned and closed in 1985, no property could have been more irresistible or ripe for his golden touch. In 1987 Eure reopened the landmark store-turned-tavern-turned-seafood eatery. From the license plates of former statesmen that adorn the walls to the shoeshine station, the marriage of history, great food and Eure’s hospitality brought new vitality to downtown. The enormous mural that crowns the interior of the restaurant features Eure as a sailor suit-clad 7-year-old and his father, North Carolina Secretary of State Thad Eure, Sr.; North Carolina Secretary of Agriculture Jim Graham; North Carolina State Treasurer Harlan Boyles; and Raleigh developer Willie York. After Thad, Jr.’s death, his protogées-turned-partners in 42nd Street, Brad Hurley and John Vick, acquired Eure’s interest. The restaurant remains a legendary landmark. 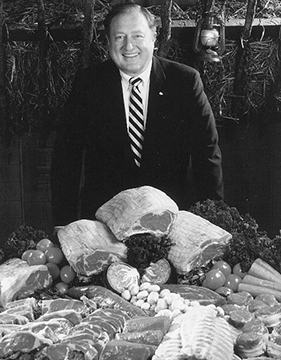 Eure served on the National Restaurant Association board of directors and was president in 1978. His term was characterized by his rare concept of hospitality and many political actions that bettered the industry. He also worked with the U.S. Culinary Team to promote the team's participation in the International Culinary Competition where the team won the gold medal. His dedication to his community included coaching little league football, raising funds for colleges and promoting North Carolina tourism. Van remarks that she is often approached by men her father once coached. With tears in their eyes, former little leaguers, now fathers, recall the giant of a man who not only taught them about football, but also about life. 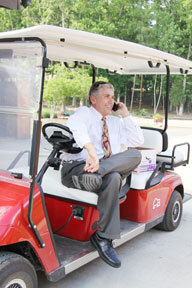 Eure had a passion to improve the city of Raleigh, and he championed road improvements. 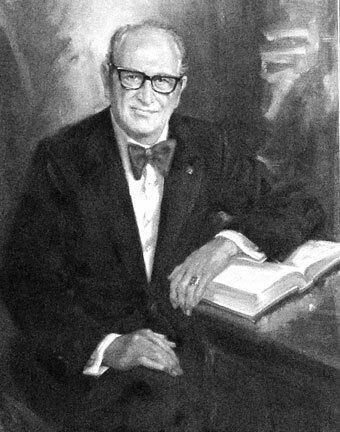 He led the fight to pass bonds for the building of the Convention Center and lobby renovations for Memorial Auditorium. He was the advocate for the redevelopment of downtown Raleigh into the epicenter that it is now. Years before the great convenience of I-540, Eure had the forethought to hire engineers to draft a plan that would facilitate traffic flow. As difficult as bonds are to pass, Eure led the long, successful fight to pass the bond that green-lighted construction. The National Restaurant Association’s highest honor is the Ambassador of Hospitality Award. Just months after Thad’s untimely death in 1988, the NRA selected him as the award recipient. Not only was he honored posthumously, the award was renamed The Thad Eure Ambassador of Hospitality Award. Alice’s name would be added later. Today, The Thad and Alice Eure Ambassador of Hospitality Award is given annually to an industry leader of exceptional accomplishments and character. The next time your taste buds relish the Barn’s award-winning chocolate chess pie or our tangy barbecue sauce, you may thank the late Alice Eure. As your eyes rove through the Barn’s rustic Americana decor, you can bet a whole chocolate chess pie that Alice lovingly placed almost every furnishing. Every October, you may see thousands of walkers in the parking lot as they assemble to raise money and awareness for mental illness research and treatment. They are here because of the countless good works of Alice in her relatively short lifetime. By Thad’s side, she helped build, decorate and operate their restaurants: the Angus Barn; Darryl’s; 42nd Street Oyster Bar; and Fat Daddy’s. In addition to her innumerable contributions to their many restaurants, Alice was a superb interior designer who co-owned Stewart Woodard Galleries with her talented partner Stewart Woodard. As a decorator, the “Alice Eure touch” meant that all elements in a room worked to create an atmosphere of visual splendor. The spacious, plush wingback chairs in the lobby and the room where her husband’s coveted gun collection is displayed are mere examples of Alice’s impeccable taste. Among her most treasured attributes were her robin’s egg blue eyes that could engage you without Alice even speaking one word. As if her eyes were not enough, Alice’s sense of humor and comedic timing could well have made her Lucille Ball’s twin. Those fortunate enough to have spent time with Alice gladly attest to her ability to instantly erase tension in almost any situation with the most disarming wit. But of all the attributes that made her the very pillar of strength and grace, no quality is more evident in her legacy than compassion. For example, while driving to the Barn, Alice noticed a neglected dog tied to a tree. Day after day, he sat there, unattended and sitting alone in the dirt with no doghouse in sight. No longer able to stand it, she turned into the driveway, went to the door and asked to buy the dog. The owners were startled but agreed. Upon freeing the dog from the tree, Alice discovered a nail that held the dog’s collar on was embedded in its neck. With tenderness and urgency, unconcerned about the interior of her car, she took the poor animal home for a well-deserved bath. And so began an enduring companionship between Alice and her new canine buddy named Lucky. After all, what name could be more appropriate for a dog fortunate enough to be rescued by Alice? In the early 1980s, Alice’s faith in action found her immersed in the plight of mental illness and ways to help those afflicted. Over many months, Alice traveled extensively in search of answers to this much ignored issue. Meeting after meeting with experts availed little hope. Psychiatrists and clinicians explained that not only was there no cure, mental illness was the hopeless stepchild of medical research. The collective cry she heard was that more research was imperative. For Alice, this was her most inspired call to arms. She would meet this challenge head-on with dogged determination. 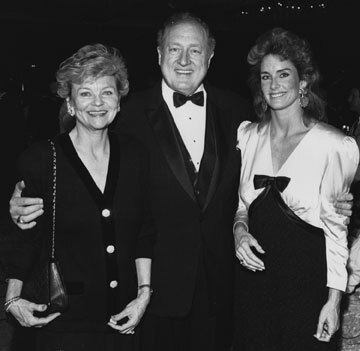 She and Thad established The Foundation of Hope in 1984 to raise funds and awareness for mental illness research and treatment. Alice realized that the money raised may not make an immediate impact but that someday the research could help provide cures. To date, The Foundation of Hope has provided $3.1 million to fund local research. The University of North Carolina School of Medicine honored her efforts with its Distinguished Service Award. This was only one of the many accolades and awards she received. 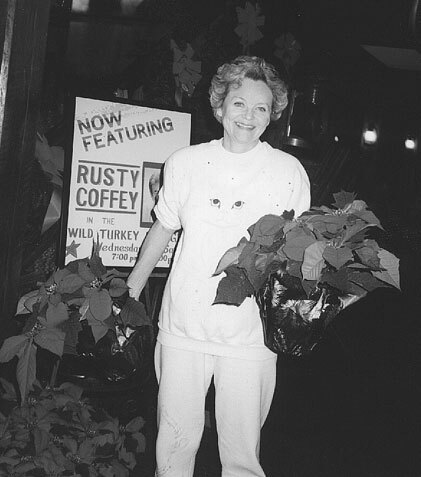 She also served on the board of directors of the North Carolina Restaurant Association and the Raleigh Bicentennial Committee. 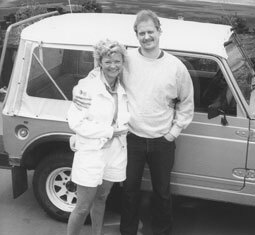 Alice was again tested in 1988 when she lost her partner in life, Thad, to pancreatic cancer. In the years following his death, Alice, in spite of her tremendous grief, continued to oversee the Angus Barn as well as the other Eure restaurants and to further develop the Foundation of Hope. 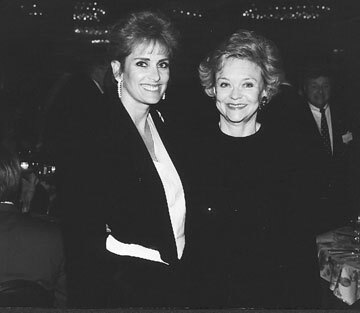 In May of 1997, Alice was diagnosed with ovarian cancer. In her short 66 years of life, she met every adversity with resilience and thanksgiving. Her battle with cancer would be no different. One of the nurses who cared for Alice in her final days eloquently told Van, “In the 25 years that I’ve been a nurse, I’ve never been as impressed with anyone as I was your mother. Even during her suffering, she was full of goodness.” Alice was a living example of how the value of life does not lie in the length of days but in how we use the days we’re given. Her life was filled with uncommon exuberance, beauty and humor. “She was Raleigh’s own Grace Kelly,” says son-in-law Steve Thanhauser. “Her caring and compassion made a tremendous difference,” Van remembers, “Those who knew her considered themselves lucky.” There was nobody like her. She was a true lady. She was cut from the cloth of great statesmen and entrepreneurs from whom she inherited her pure, stubborn optimism. Tell her it can’t be done, but get out of her way. She’ll prove that it can, flashing you a blinding smile. She’s the first one standing at “The Star-Spangled Banner.” She’s a patriot who champions the privilege of voting. She rescues abused animals. She was a collegiate swimmer at UNC. Diplomatic to her core, she’s also gifted with a spontaneous sense of humor that can double you with laughter. For her, environmentalism is not an option; it’s a duty. Genuine kindness and respect are necessities upon which she insists from every Angus Barn team member. Believing as her father did that money is not made in an office, she shares an attic space with longtime assistant, Jill Highsmith. You’ll find her canvassing the restaurant, shoulder-to-shoulder with 300 team members, tirelessly expanding her parents’ legacy. Van’s road to blazing her own trail comprises a most inspiring story. At 14, Van’s Angus Barn education began. Her parents believed in an after-school regiment of jobs. While her peers knew the care freeness of youth, Van tackled a myriad of jobs that instilled a lifelong work ethic. From janitorial to waitressing, she learned life skills. There was no car in the driveway when her 16th birthday arrived. She understood her parents’ law: If you can work, you can buy your own car! For all of her parents’ success, there were no spoils; only responsibilities. Although she was raised southern, Van’s spirit was nomadic. After college, there was no other course but to flee the world of conveniences. She found her new world on the African continent where she climbed Mt. Kenya. She fell in love with Kenya, establishing a Montessori-type school where she taught children who still adore her to this day. After five years, the expatriate returned to her roots. When the Wild Turkey Lounge opened, Van bartended, thinking that it would be a temporary job – ha! Instead, she began to see her father and the restaurant business in a new light. It was a blessing they finally had a chance to establish a deep respect for one another because tragically in September of 1988, Thad was diagnosed with pancreatic cancer, leaving Van thwarted at the prospect of losing him and carrying on his king-sized legacy. There were naysayers who doubted the Barn could run without Thad, yet another Eure would defy expectations. “Big Red” became her new calling, and Van immersed herself in work, slowly beginning to make her individual mark. She followed her father’s philosophy of hospitality but sought her own unique style of management. She based her management paradigm on the belief that empowering her team to make their own decisions would boost morale and steepen loyalty. And it worked! She also became a student of Ken Blanchard, the famous author of The One Minute Manager. As her leadership grew firmly rooted, she found herself surrounded with exceptional loyalty. Today, it’s easier to get a job with the FBI than the Barn. At a mere 14%, employee turnover is exceptionally low. Van requires each job candidate to be thoroughly screened. Respect for fellow team members, guests and the values for which the Angus Barn stands is simply not optional. One of the most important, enduring examples of respect for guests is documented in an episode of the CBS series 48 Hours on “Customer Service.” Unbeknownst to Van and to her team, a reporter wearing a hidden camera posed as “the guest from hell” one evening. She complained about every detail. Although the team rallied with solutions and smiles, the reporter persisted. Finally Van approached to extend further diplomacy. To her great surprise, she learned the purpose of the reporter’s visit. The reporter’s verdict: the Angus Barn was the perfect example of customer service. Van was not the first workaholic in the family, but she was the first Eure to be married to a restaurant rather than a human. Exhausting workweeks seemed all that her future held until advertising guru Steve Thanhauser asked her to a movie. An accomplished career man and a single father, Steve’s own life was full. From the start, Steve understood that persistence attracts stubborn optimism. He knew intuitively that the way to Van’s heart was to respect the importance of her work. When Steve proposed in front of her work family, there wasn’t a dry eye in the room. Van became part of a three-member family that included Steve’s son, Christopher. They made the perfect family as Van had fallen madly for Christopher, too. When Van and Steve built The Pavilion, they moved closer to fulfilling her parents’ dreams of expansion. Who knows what this talented couple will achieve together as we begin the 51st year of the Barn? Only months after Van married Steve, she faced a great challenge when she lost her mother and partner, Alice, to cancer. The monumental loss of her mother affected Van powerfully and therefore, when she began to feel lethargic, she assumed it was only a reaction to her profound grief. And then, just when her life could not become any more tumultuous, Van shockingly discovered these symptoms were normal because she was expecting - at age 44! Sarah Alice Thanhauser, the namesake of both grandmothers, was born one year after Alice’s death. Today, at the innocent age of 11, “Ali” is a statuesque reminder of her mother’s physical height and unstoppable energy. 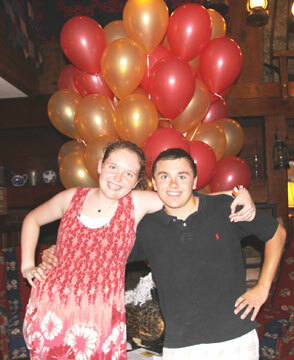 Ali and Chris are frequent fixtures at the Angus Barn working with Van and Steve. Inheriting Alice’s deep compassion, to date, Van has rescued swans, fawns, llamas, wild ponies, horses, a pot-bellied pig, and more dogs and cats than you’d find in an area shelter. In 1998 Van learned the story of a quarter horse named Cheyenne who, while in a trainer’s care, was severely beaten. Van was outraged when she learned that the trainer was only convicted of a misdemeanor, and she would not rest until the legislature passed a felony cruelty statute. Hence she formed The Cheyenne Foundation whose mission is to provide funds for the prevention of cruelty to animals. Thad, Jr. was eulogized as a builder of people, not just restaurants. Like her father, Van is a builder of people, too. She loves facing a challenge every day that takes her out of her comfort zone, just as she did that fateful day that Thad challenged her to learn “Big Red.” Thankfully for us all, she accepted. The future still holds countless dreams and challenges. With her brave optimism, Van invites you to join her in writing the finest chapters yet in Angus Barn history. Upon retiring from IBM in 1979, New York state residents George and Sarah Thanhauser migrated south to the greener, cleaner pastures of North Carolina and settled in Wake Forest. Their eldest child, Steve, visited his parents frequently and grew increasingly attached to the Raleigh area. After pursuing his graduate degree at Virginia Tech in hotel and restaurant hospitality, Steve moved to Raleigh to open his own nightclub. Capitalizing on the prolific music scene that once characterized the city, Steve’s bar, The Bear’s Den in Cameron Village, was a live rock-n-roll nightclub that became a cornerstone in Raleigh’s “Underground.” Modeled after the Atlanta Underground, the area brought music artists to Raleigh who would not otherwise have come. For years, Steve poured himself into the club, bringing Raleighites many spectacular musical memories. Groups such as Arrogance, The Fabulous Knobs, Glass Moon, The Spongetones, Control Group, PKM and Mike Cross played to oversold crowds at Steve’s well-known bar. After five years of making a name in the nightclub scene, he decided to try his hand at selling advertising when he was offered a job with the new, regional rock format station, WRDU 106.1 FM. WRDU went on to become one of the top 10 rock stations in the country. It was while Steve was at WRDU that the gradual, steady intersection of the lives of Steve and Van began. Who would have thought that a business letter written to Steve’s colleague apologizing for a disappointing experience at the Angus Barn would have been the catalyst? Steve studied the letter, poring over every paragraph, greatly impressed by Van’s remarkable sense of hospitality and tact. In fact, he was so impressed that he kept the letter and later hung it on his office wall at MarketSmart as an example of excellent customer service when he was training new staff. A couple of years later, the Angus Barn and WRDU sponsored a Bonnie Raitt benefit concert for Planned Parenthood. The minute Steve knew that Van was at the benefit, he sought her out to tell her about the letter he’d saved for two years. That’s when he discovered that the genuine spirit behind her letter was like his own. The mutual, charitable spirit that they shared led Steve to ask how his radio station could help the Foundation of Hope. Van ecstatically accepted his offer because the Foundation had long needed a media sponsor. As an added bonus, his undeniable zest, charisma and resonant voice led him to become the emcee for ever-increasing crowds who now will not accept another emcee. Steve, along with long-time friend Greg Cox, eventually built MarketSmart, a full service advertising agency with offices in North Carolina, Washington, D.C. and Connecticut. Coincidentally, many of his clients were in the restaurant business. Shortly after Steve’s proposal, Alice learned that she had cancer. Due to Alice’s prognosis, Van and Steve decided to shorten their engagement and to make their wedding a quaint, intimate occasion in Alice’s front yard. 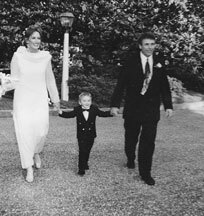 Of his great fortune, Steve remarks, “I married my soul mate in 1997 and we’ve been each other’s sidekicks ever since.” Steve’s three-year-old son, Christopher, was not only the ring bearer in the wedding, he took vows with Van and Steve. Luckily for Van, he said ‘yes’ when asked if he would accept Van into his life. According to Steve, sharing a dream is the best way to start life together. Steve and Van first imagined expanding the Angus Barn experience, adding a new dining facility by the lake on the Angus Barn property that would cater to groups of 100 to 350. Ten years after marriage, their dream took shape as the open-air, year-round, heated structure and surrounding amphitheater sprang to life. The facility, built exclusively from historic, reclaimed materials, is the newest addition to an expanding Angus Barn campus originally envisioned by Thad and Alice. In 2008, The Pavilion opened with Steve at its helm. His gifts of simplifying difficult situations and finding solutions to problems have contributed enormously to the success of The Pavilion. Steve proudly carries on the family tradition of incomparable hospitality begun by his late father-in-law, Thad Eure, Jr.
Family is what Steve values most, according to those who know him best. Working or not working, Steve is surrounded by family. His two children, Christopher and Ali, are the light of his life. Steve’s mother comes from a large Italian family who celebrates the tradition of making meals from scratch while everyone gathers to share during the process. Steve admits that he’s blessed with an incredible family that includes his brother, David; sister, Susan; and aunts and cousins living in the Triangle. Steve could easily have chosen many career options, but he chose to apply his keen marketing skills and huge business acumen to help Van expand the dream her parents held for the Angus Barn.